Her candle burned at both ends and cast a light on everyone lucky enough to know her. Her stories enriched The Mango Bride but she left us too soon to read it. Re-posting this piece to mark this fourth year without my beloved Tita Tess. I used to think the word “bittersweet” was just another torch song cliché, the sort of Latinate expression that Tom Spanbauer would have expunged from my text in a Dangerous Writing class. But over the last week, I kept returning to it as the only word to describe the tumble of events. At yoga class one Thursday in August, I managed my first unassisted headstand (sweet). That afternoon, the book contract from Penguin arrived in our mailbox (double sweet). An hour later I learned that my favorite aunt, Tita Tess, had succumbed to cancer. A consummate diplomat, Tita Tess set up homes in Bern, Bangkok, Rome, Vienna, and Bombay, somehow finding time in between to flee a disastrous first marriage and leap, heart first, into a second, two young daughters in hand. Forsaking her career to support her husband’s, she held court as wife of the Austrian cultural minister in Rome and learned a few languages to ensure nothing escaped her notice. Dinner at Tita Tess’s home was a carnival of tongues, with Sasha and Tracy trading gossip in Italian, Uncle Franz joking in German, my aunt directing the cook in Ilonggo, and me, keeping up in my profoundly plebeian English. I visited her home in the chi-chi Parioli district of Rome at 21, a naive college graduate, bedazzled by Europe and besotted by my first European beau. Delighted at this chance to play Auntie Mame, Tita Tess walked me around Trastevere and her favorite basilicas, then took me on a train through the Tirolean Alps to watch my first opera in Vienna. The world was my oyster, but she was the pearl. When the affair imploded, I sought Tita Tess out again, unwilling to return home to my mortified parents. “My God, you should be grateful,” Tita Tess would chide, over bottomless goblets of chianti. “Most people would kill to be in your shoes, nursing a broken heart in Rome.” I really should have listened, but the city of persimmon buildings with kissing couples on every block offered meager comfort to an overwrought 21-year old. And yet Tita Tess persevered, distracting me with books and deliciously inappropriate anecdotes about our large extended family. I must have paid attention even as I wept, for decades later the lore she passed on enriched my first novel. Sadly, all those years of carousing in smoky cocktail parties finally caught up with my aunt. Last May she collapsed in her Vienna flat. Doctors discovered that cancer had colonized a good part of her innards. I emailed her a copy of my novel, thinking to amuse her. When she complained she couldn’t focus on a computer screen, I dreamed up a plan to fly to Vienna and read the whole manuscript to her at the hospital. “You know, summer plane fare costs so much that I’d have no money left for beer,” I joked on one of our last phone calls. “Oh, just come. I will pay for your beer,” Tita Tess promised. She never got around to picking up the bar tab. A week before her flight home to Manila, my favorite aunt passed away. 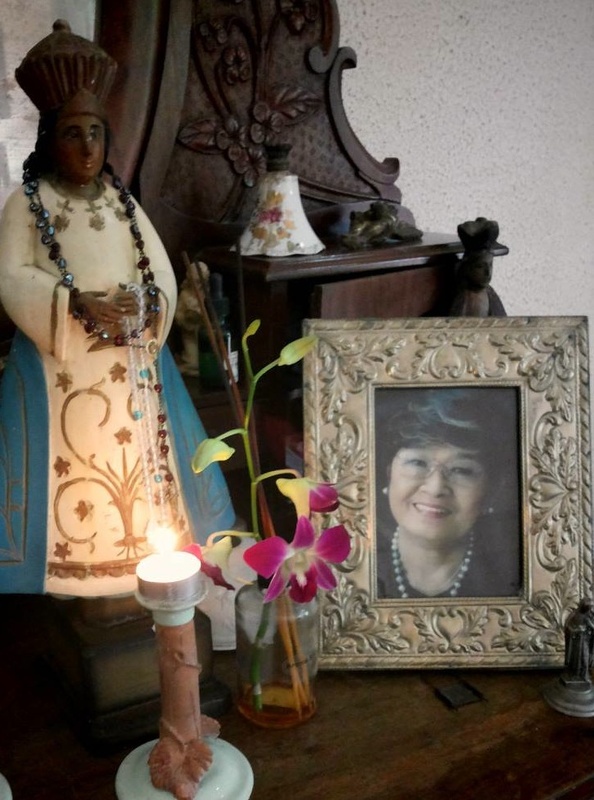 The next morning I wrote Tita Tess’ obituary and emailed it to our family in Manila. After that I signed the Penguin contract and sent it back to New York, marking two milestones on the most bitter of sweet days.